Are you involved in community service? 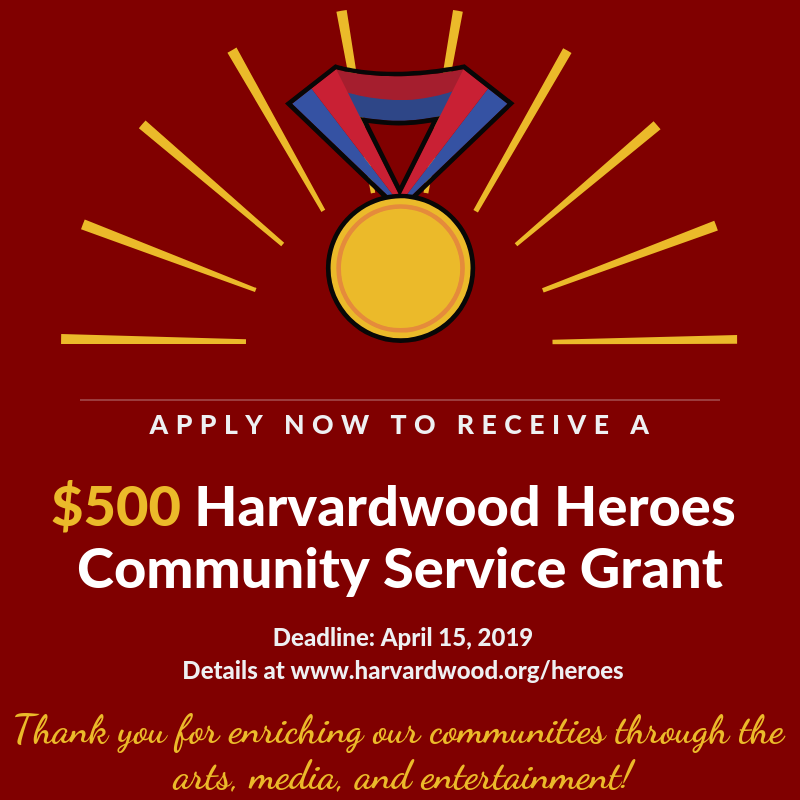 Apply for a $500 unrestricted grant via Harvardwood Heroes! Harvardwood is a Harvard Alumni Association Shared Interest Group that supports Harvard students, alumni, faculty, and staff in the arts, media, and entertainment. We are now accepting applications to two opportunities that might be of interest to you and your Club/SIG members. We would greatly appreciate it if you could pass along the information below to them, so that they may apply or forward the info to eligible interested parties to apply. There are no application fees, and you do not need to be a Harvardwood member in order to be eligible to apply. Thanks in advance for your assistance, and please get in touch if you have any questions about either program! Launched in 2013, the Harvardwood Heroes grant program aims to spotlight and support Harvard students, alumni, faculty, and staff who have made an exceptional contribution to the community. These Heroes exemplify the mission of Harvardwood by demonstrating the power and purpose of the arts, media, and entertainment in the betterment of our communities. Every year, the program awards $500 grants to up to four applicants who have demonstrated a distinguished level of service to their organizations of choice. Read about the community service work that past Heroes have performed! 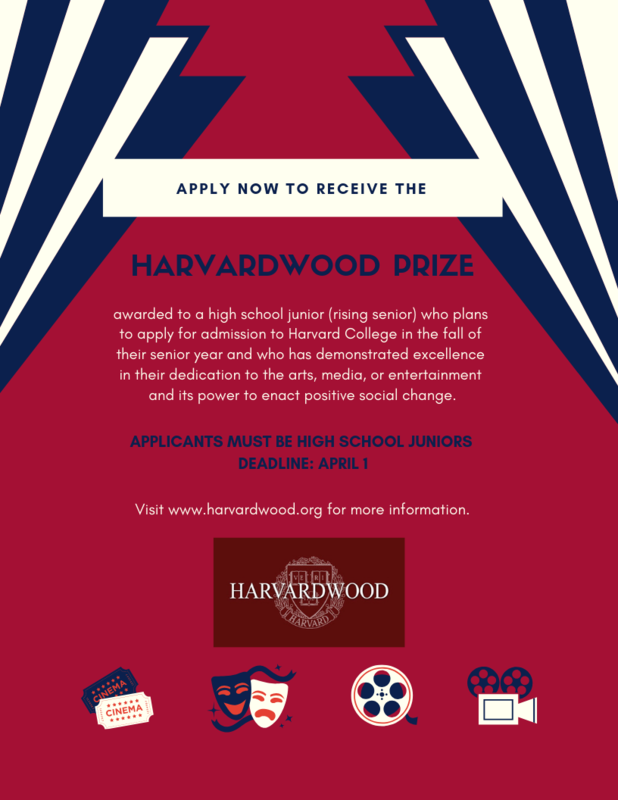 We are now accepting applications from high school juniors to receive the Harvardwood Prize, founded to recognize and celebrate the artistic accomplishments and potential of high school students who exemplify Harvar dwood's mission. The Prize is awarded annually to a high school junior (rising senior) who plans to apply for admission to Harvard College in the fall of their senior year and who has demonstrated excellence in their dedication to the arts/media/entertainment and its power to enact positive social change. Could you be a Harvardwood Hero? The Harvardwood Heroes grant program spotlights and supports Harvard students, alumni, faculty, and staff who have made an exceptional contribution to their local communities. These Heroes exemplify the mission of Harvardwood by demonstrating the power and purpose of the arts, media, and entertainment. Any Harvard alum can apply for a Harvardwood Heroes grant—you do not have to be a Harvardwood member. We will award $500 grants to four applicants who have demonstrated a distinguished level of service to their organizations of choice (priority given to arts-related organizations/projects and to Harvardwood members). Read about previous Harvardwood Heroes and their community service. About Us: Harvardwood is a nonprofit organization for members of the Harvard University community who believe in the power and purpose of the arts, media and entertainment. By providing professional resources and service opportunities, Harvardwood strives to utilize the creativity and leadership of our diverse members as forces for positive social change.